March 28, 2015 Admissions, Alumni, Events, Faculty & Staff, Students Comments are disabled after 182 days. Saturday’s biting breeze and snowy commute confirmed it: It’s still March in Pennsylvania! 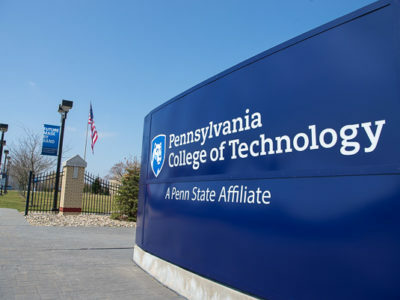 Far more predictable was what campus visitors found all day at Penn College’s Spring Open House, as helpful and personable students, employees and alumni encouraged potential enrollees and other visitors to explore a national leader in applied technology education. Ambassador Stephanie E. Falcone spreads the word on social media. Richard K. Hendricks, instructor of machine tool technology/automated manufacturing, warmly welcomes a family to College Avenue Labs. Under the see-all eyes of the campus mascot, Open House guests report for check-in at the Field House. With a day full of activities to cross of their lists, families hit the ground running by attending a helpful information session in the Klump Academic Center Auditorium. Landscape/horticulture graduates Kyle B. Brown, ’11 (left), and Jeremy L. Thorne, ’13, revisit as alumni volunteers. Penn College Pride, off the rack and on the road to success! Ambassador Morgan N. Keyser maps out the day’s itinerary. Charese M. Bova, a senior in electronics and computer engineering technology from Beech Creek, works on her senior project during Open House. Ambassador Ryan S. Schrimp points a guest in the right direction. Bethany M. Reppert, of Minersville, graduating in May in applied human services, helps welcome her brother, Alex, enrolling for Fall 2015 in collision repair technology. … where instructor Glenn R. Luse and Lee D. Bouton (far right), a buiding construction technology: masonry concentration senior from Stillman Valley, Ill., talk shop with visitors. Shaping up for a career as a physical fitness specialist? Who better to explain a major than a current student? Men’s volleyball club coach Bambi A. Hawkins (left) and women’s volleyball coach Monica L. Brown helped staff the Wildcat Athletics tables in the Bush Campus Center TV Lounge. Dining Services’ Bernadine M. Welkovitch (right) guides a family through the vast array of delicious options in Capitol Eatery. Veterans Affairs Work-Study employee Jacob M. Heuman, a building automation technology major from Boiling Springs, talks with a couple about their military education benefits. Standing ready in the Dauphin Hall lobby, Resident Assistants Hallie J. Liberti (left) and Charlie A. Geisel offer a warm welcome on a chilly day. Alumnus Christopher J. Allebach (’13, computer aided product design, and ’12, computer aided drafting technology) chats with visitors in an engineering design technology lab where he presented “A Journey From the Classroom to a Career” throughout the day. Allebach is a design engineer at Dorman Products in Colmar, a producer of automotive parts found on cars to 18-wheelers. Construction & Design Technologies’ Marc E. Bridgens, dean, and Carol A. Lugg, assistant dean, explain degree opportunities for a Thompson Professional Development Center crowd. Student Daniel F. Clark (left), of Royersford, and horticulture instructor Carl. J. Bower Jr., take an Open House attendee through the hydroponic garden. A virtual training module gives guests a welder’s-eye view of a wise occupational choice. Wintry temperatures even left this School of Sciences, Humanities & Visual Communications resident chilled to the bone. David R. Cotner, dean of industrial, computing and engineering technologies, presides over an informative session in Penn’s Inn. Joseph C. Straw, assistant professor of diesel equipment technology, acquaints visitors with equipment-related majors at the Schneebeli Earth Science Center. Answering a family’s questions in the SASC is Dennis L. Correll (second from right), associate dean for admissions and financial aid. Electronics and computer engineering technology students fill a lab in the BWD ready to share their projects with visitors. Friendly faces share information about their trending major. Ryan J. Bollinger, a freshman in automotive restoration technology from Mount Joy, shows off his lab’s vintage vehicles to visitors. Faculty members Katherine A. Walker and Craig A. Miller assist a young visitor in 3D-scanning Olaf, the famous “Frozen” snowman, in the engineering design technology labs. Jim W. Green, assistant director of financial aid, takes the mystery out of paying for college. Danielle M. Liddic, coordinator of employer/industry relations, talks “degrees that work” in the Bush Campus Center. Diesel technology grads Eric F. Faust (left), Class of 2009, and John D. Motto, ’11, lead a tour of their former ESC labs. Motto, a diagnostic technician with the Penn Power Group in Muncy, services machinery for Faust, an equipment foreman with Halliburton. Summer 2014 radiography grad Cortney N. Allen, among the alumni who generously honor their Penn College roots. A trio of fervent Penn College cheerleaders – admissions representative Sarah R. Shott (left); Ryan Monteleone, presidential student ambassador; and admissions representative Claire Z. Biggs – share their exemplary pride. … in a series of judged events that tested dexterity (and cold-weather stamina). Open House: touting “degrees that work” in working laboratories. Veteran faculty member Richard C. Taylor, associate professor of plumbing and heating, shares success stories of highly marketable HVAC graduates. Joseph J. Balduino, director of admissions, provides an introduction to Penn College during a general session in the ACC. Aviation instructor Michael R. Robison takes an Open House group through the airport hangar. The wide-ranging menu for campus involvement is shared by Anthony J. Pace, assistant director of student activities for student organizations/orientation. On a frosty morning, ambassador Ryan Monteleone breaks the ice at check-in. Colorful decorations atop the Capitol Eatery salad bar remind visitors of springy days ahead. Ambassador Kyle D. Bomboy guides a family outside an information tent. Nursing educators lend a personal touch to a popular program. Even before noon, Admissions computers were in big demand by applicants in the Student & Administrative Services Center. Adam J. Yoder, a 2011 graduate in building automation technology, returns to campus as an alumni volunteer. Frigid winds whip the large American flag at the campus entrance. David C. Pistner (left), director of special projects, and John F. Strittmatter (right), director of the ShaleNet U.S. Regional Hub, enlighten visitors on job prospects in a dynamic field. Matthew G. Cummings, a senior in electronics and computer engineering technology from Mountville, fine-tunes an inverted pendulum project. A four-year member of the Wildcat archery team, Cummings will move to Topeka, Kansas, in May to begin his job as a project engineer at Mars Chocolate North America. Ambassadors Trevor I. Brandt and Cassandra B. Mohr on check-in duty, providing valuable student perspective to possible freshmen-in-waiting. Automotive instructor Chad H. Rudloff outlines the curriculum in the Mopar CAP program, the college’s newest factory training major. The Jackson family of Granville Summit handily fills the frame. Hands-on examples of occupational therapy assistants’ invaluable contributions. Successful alumni returning to share their day include Jared P. Miller, a 2008 graduate in heavy construction equipment technology: operator emphasis, vice president of City Hill Construction in Penn Yan, N.Y.
Instructor Spyke M. Krepshaw details an array of possibilities for a typical crowd of information technology prospects. Tylor J. Burkett, an aviation maintenance technology major from Middletown, adds his perspective to a Lumley Aviation Center tour. Welding lecturer James C. Tanner meets with a group in the Avco Lycoming Metal Trades Center. Andrew Bartholomay (left), assistant professor, and instructor Eric C. Easton talk with forest technology prospects. Hunter S. Forney (left) from Shippensburg, and Adrian I. Mundo, Selinsgrove, seniors in electronics and computer engineering technology, share their projects with a young guest. The faces of the future make an instant memory. Automotive instructor Eric D. Pruden converses with a family. Fitness Center assistant Domenick S. Schiraldi-Irrera offers an overview of the equipment … and an impressive view of campus. It’s a full house for the 10 a.m. School of Transportation & Natural Resources Technologies overview in College Avenue Labs, featuring Brett A. Reasner, dean. Making brake pedals for the mini-Baja vehicle are manufacturing engineering technology juniors Jason B. Miller (left), of Mount Joy, and Shane A. Linderman, Leesport. Instructors William J. Bashista Jr. and Claude T. Witts share their diesel/heavy equipment experience. School of Health Sciences’ well-equipped labs are perennially popular with visitors. Student as spokesperson: a tradition at Penn College Open House. Kira I. Dorn, an aviation maintenance technician major from Centerville, leads a tour of the Aviation Center. A summary of Penn College’s human services program is provided by instructor Deb Q. Bechtel. Edward A. Henninger, dean of health sciences (along with the off-camera Sharon K. Waters, associate dean), address the crowd at one of three school sessions. Electrical technologies-occupations/building automation instructor Kevin J. Snyder brings nearly two decades of industry experience to his lab. Diesel curriculum is outlined by instructor Mark E. Sones. Another good sport enjoys her campus visit.